BH Locksmith in Houston TX providing Commercial service we understands how important is to keep your business safe and secure. With our best locksmiths who are trained and licensed, you can be sure that you are going to get the best commercial locksmith services in the Houston area. Our commercial services locksmiths are constantly being trained in the most of the commercial locksmith Houston technologies and they are given the best tools and technologies useful for a quality locksmith work. By using the pool of trained commercial locksmiths equipped with latest technologies and tools, we are always sure and ready to help you with any commercial locksmith services you need. We truly understand that being locked out of your business means that you are losing money. We provide 24 Hour Locksmith Houston commercial locksmith services and our experts can be on the scene within 20 minutes of your calling. With a sound knowledge staff we will help you to get back into your office as fast as possible. Do not wait for any unskilled locksmith! He may waste your time. Call BH Locksmith today and take the use of advanced commercial locksmith Houston services. 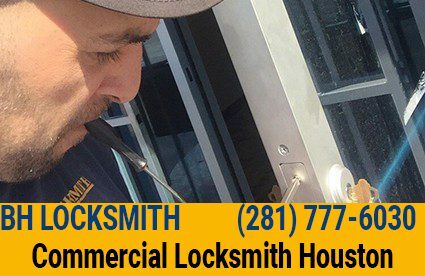 We already have thousands of satisfied clients for commercial locksmith services in the Houston area and many of them have turned up into our regular customers. Our commercial services include solutions for lost office keys, safe combination resets, rekeying, high security locks and system installations, file cabinet solutions, master key implementations and all other commercial locksmith Houston you would think of. BH Locksmith is ready 24 hours a day and seven days a week to help you in any type of emergency locksmith needs. Do not wait for the next office hours and call us anytime you need for emergency locksmith services. We are aware that commercial security is of very high importance to our business and industrial customers thus we only provide the finest in high quality work to our customers in Houston, TX. Our locksmiths in Houston are experts at setting up high-security lock installations and commercial lock repair at commercial locations, and we provide free of charge consultation services to enable you to select the ideal selection for your business. Our mission is to supply and set up high quality security tools that suite your individual companies requirements in the most efficient manner possible. Commercial locksmith service in Houston has been BH Locksmith business since 2015. Even though we have expanded our services thru the years to include many facets of security, we are and will always be a commercial locksmith first. All of BH Locksmith technicians are first trained at commercial locksmith skills before they receive training in Access Control, Safe Service.